A patent published by the U.S. Patent and Trademark Office reveals that Apple is considering creating a 'headless' device which converts the iPhone into a 'laptop'. Interestingly, this brings Apple further into Microsoft's 'fridge-toaster land' with its aspirations towards the HP Elite x3 with Lap Dock functionality. Apple Insider reports that the Apple iPhone dock would be designed to look like a MacBook with the signature aluminium construction and so on. While the iPhone provides CPU and OS the 'headless' dock could bolster its capabilities, not just with a larger screen and the physical keyboard, but with GPU, extra connectivity options, battery expansion, and more. It is noted that the size on an iPhone 7 Plus is pretty similar to the touchpad on a new MacBook Pro model. Of course the phone is more than capable of force-touch input and haptic feedback. 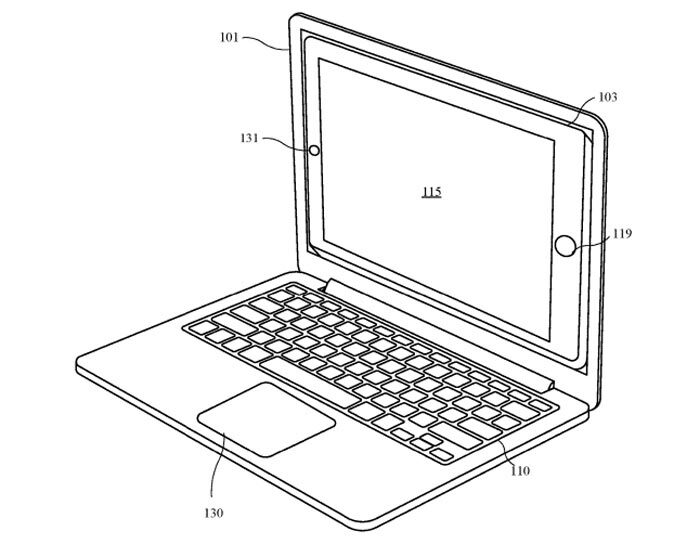 Due to the use of iOS software the 'headless' laptop dock will be equipped with a touchscreen. There was an iPad dock design also put forward by Apple in the same document In this design, pictured directly above, the iPad becomes the 'laptop' screen with a regular multi-touch pad situated in the palm rest area below the keyboard. According to Apple Insider these dock designs are "highly unlikely" to make it to market as they go against Apple's stance on portable computing and recent campaigns to position iPad Pro devices as laptop replacements. 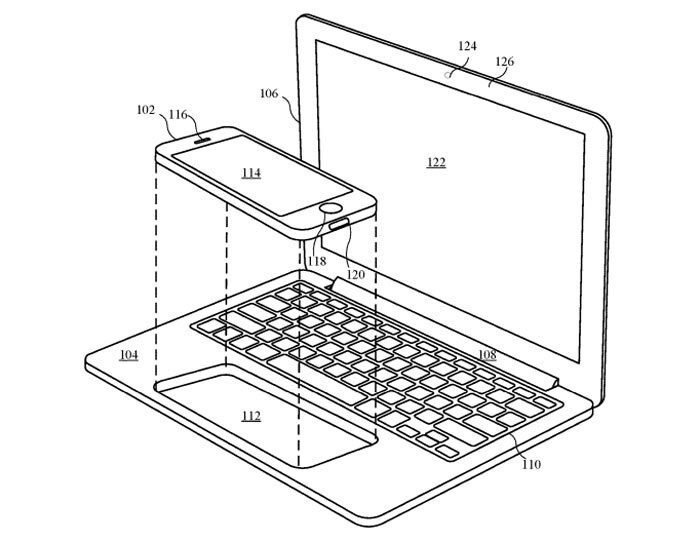 Nevertheless with the publication of these patents today Apple is, or was quite recently, looking at ways to bolster its iOS device appeal and sustain sales with laptop docks for iPhones and iPads. lol apple and their ‘original’ ideas…. so its like the ASUS padfone https://www.asus.com/Phone/PadFone_S_PF500KL/ (available since 2011) but instead of behind the screen its in a keyboard. I sense apple and asus lawyers getting itchy fingers. While there are obviously existing products, I have to say I really like the idea behind this one. You've got a touchpad that pretty much anything could be designed for, running laptop that could be screen, keyboard and a massive battery. It would obviously not going to be serious competitor for a dedicated laptop or desktop but the potential would be fantastic given the power of mobile chips now. Shame it will never really take off anytime soon, but I really like the idea behind it. From a personal viewpoint it's a shame it's Apple, but if anyone could make it work it would be Apple and their lack of fragmentation. I suppose with USB-C now someone like Samsung could attempt it - they've already got the DeX HDMI dock coming with the S8, and that's pretty much this without the built-in screen and keyboard. I thought that, I wonder if Asus have a similar patent so they can block it.